This story onNo. 17 athlete Barry Bondsappears in ESPN The Magazine's April 2 Dominant 20 Anniversary Issue. Subscribe today! WHENEVER I THINK of Barry Bonds -- his dominance, his flaws, his legacy -- the first image that appears in my mind is Dennis the limo driver. 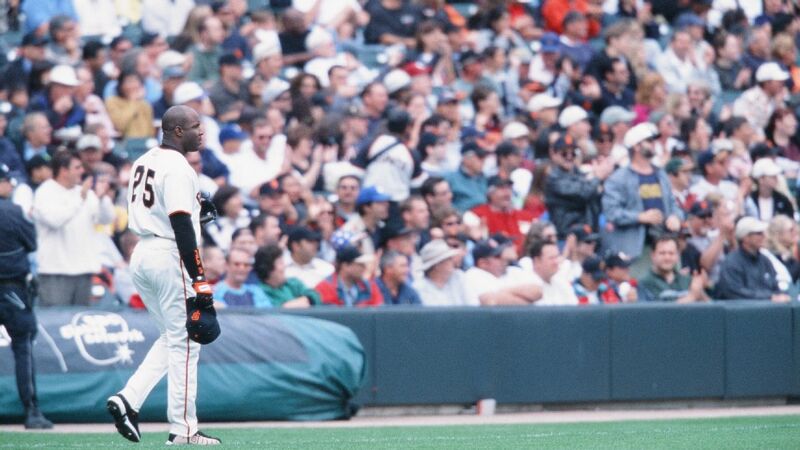 Dennis burst onto the scene in spring 1993, Bonds' first season with the Giants, wearing the full chauffeur getup: black suit, white shirt, black tie, black leather driver's cap. He had been hired by Bonds to drive him to and from the ballpark in Scottsdale, Arizona, because it wasn't enough to be the best and richest player in baseball. Barry had to accessorize, and Dennis was the ultimate accessory. Dennis, for some reason, hung around the clubhouse every day, needling Bonds' teammates and talking to reporters. Barry rarely talked, Dennis rarely stopped, and whenever Bonds would turn a corner and see Dennis holding court, he would reflexively say "Shut up, Dennis." Those of us who covered the team removed the comma and referred to him, with a mixture of endearment and sympathy, as Shut Up Dennis. At the time, Dennis' presence was seen as an amusing branch of Bonds' odd personality, but over the years, the Dennis episode has acquired a deeper meaning. Crazy as it sounds, Bonds needed this. He needed the validation that came with Dennis and his cap and his black suit and his long car parked across three spots out in the lot. It created the stratification necessary to signify his status. Hey, anyone else in here have one of these? There's a power dynamic within any relationship: pitcher-hitter, player-manager, reporter-subject, employer-chauffeur. Bonds had to dominate each one, but that doesn't begin to cover it. The dominance couldn't simply lie below the surface, latent, an understanding between parties. No, it had to be explicit, openly stated, faceup on the table from the beginning of each encounter. The act of assigning legacies is among the most tired of sideline endeavors. There's nothing official, no consensus, nothing trademarked and accepted as truth. A Giants fan has a different opinion than a Dodgers fan. Someone who believes PEDs soiled America's sacred game won't agree with someone who shrugs and says everyone was doing it. But even those with a moral objection to PEDs would have to admit it was a hell of a lot of fun to watch Bonds hit bombs. His legacy is up to you, knock yourself out, but I know this: The best baseball player I ever saw was Barry Bonds, and the best baseball season I ever witnessed, in terms of sustained excellence and everyday astonishment, was Barry Bonds in 1993. The numbers -- .336, 46 homers, 123 RBIs, 1.136 OPS -- represent nothing more than residue, the shavings left after the felling of a tree. He played as if forced to prove the same point night after night, and he did it with a savage flair that made sure everyone knew exactly what was being proved, and by whom. It was a six-months-long siege, and despite all the dominance that came afterward, it stands alone -- in my mind, anyway -- as the singular achievement of his career. Eventually, of course, things got murky. Bonds went from being a first-ballot Hall of Famer with a difficult personality to an alleged cheater with an even more difficult personality who attacked baseball's most fetishized records as if they owed him money. His ambition, the side of him that necessitated Shut Up Dennis, went from a quirk to a compulsion. It began to feel desperate and more than a little sad. By 1998, when Sammy Sosa and Mark McGwire embarked on their barnstorming home run tour, Bonds was still among the best players in baseball. He had just faded slightly into the background, a 33-year-old whose best days appeared to be behind him. His decision to use PEDs -- not that he has ever admitted knowingly using them -- was, in his mind, nothing more than an attempt to restore the natural order. He did not act; he merely reacted when his supremacy was threatened. He prided himself on being more than a brute. Before Victor Conte, before BALCO, before the cream and the clear, he was smart and predictive and intensely analytical. He was willing to change, though: to become a lumbering outfielder; to prove that if he was better than everybody when clean, he'd definitely be better than them dirty. He hit bomb after bomb and took walk after walk until -- dominance rendered -- the case was made. It was all great theater, and if he hadn't existed, we can only hope someone would have had the imagination to invent him. The home run records, single-season and career, became a late-career version of Shut Up Dennis, something he needed for validation. There was always more, always something out there to chase and capture, and then -- once it became his property -- pretend it didn't matter, the echo of his cackle trailing into the void. Hey, anyone else in here have one of these? It was never enough to have everything, which just might be the only legacy he'd willingly endorse.